Exposure to the sawdust was said to cause constitutional symptoms (Lewin 1928). The wood and the seeds contain the poisonous alkaloid, cytisine. 130 species are found in north temperate regions and on mountains of tropical America and South America. Lathyrus odoratus is the sweet pea of horticulture. Photosensitivity is reported from ingestion of the plant (North 1967). Guinea pigs fed the seeds develop alopecia, slight dermatitis and ulcers on the hind legs (North 1967). The human disease, lathyrism, was reviewed by Watt & Breyer-Brandwijk (1962) and by Kingsbury (1964). The young pods of this small evergreen bush or tree are eaten as a vegetable by Malays and the mature dried seeds are eaten raw (Burkill 1935, Corner 1952). Ingestion of the foliage can cause alopecia in some animals, particularly in horses and pigs; some other animals appear to be unaffected (Morris 1896, Hurst 1942, Irvine 1961, Watt & Breyer-Brandwijk 1962). The toxic principle is mimosine (Kingsbury 1964). McKee (1958) and Owen (1958) refer to loss of hair in humans. Young rats fed the leaves and seeds can develop cataracts (Grant 1962). The biological action of mimosine was investigated by Crounse et al. (1962). Gardner & Bennetts (1956) state that this species is able to accumulate selenium from the soil and that animals grazing on the plant may therefore develop selenium poisoning ("blind staggers" or "alkali disease"). Selenium poisoning may also lead to hair loss (see Aster venustus M.E.Jones, fam. Compositae). This ability to accumulate selenium may account for the foetid, onion-like smell of this plant as mentioned by Corner (1952). Animals fed mouldy hay of this plant can develop a bleeding syndrome (Kingsbury 1964). The plant was observed to have no allergenic effect in an investigation of 'weed dermatitis' (Shelmire 1939). The wood is said to be irritant (Orsler 1973). The ground roots are applied to the skin to produce irritation (Irvine 1961). The crude plant preparation and rotenone derived from the plant can cause dermatitis, conjunctivitis and rhinitis (Thienes and Haley 1972). 200 species are native to America and the Mediterranean region. Hepatic photosensitisation can occur in animals from ingestion of some species (Kingsbury 1964). Hjorth (1968) obtained negative patch test reactions to lupin. A herbarium note found by von Reis Altschul (1973) on a specimen of this plant collected in Mexico noted that a decoction of the plant is used to delouse livestock. Thrombocytopenic purpura was observed in a male child who ate the beans (Lavy 1964). The wood was said to cause coryza-like symptoms (Legge 1907). Cuban sabicu is Peltophorum adnatum. 150 species are native to regions from Mexico to tropical South America and to the West Indies. Some of the jacaranda or rosewood timbers are provided by species of this genus and by Dalbergia. Dalbergiones derived from the wood were found to be responsible for allergic contact dermatitis in machinists (Ogiyama and Yasue 1973). The literature concerning contact dermatitis from the wood of this species was reviewed by Morgan et al. (1968). They observed an outbreak of dermatitis in a furniture factory. The hands, cheeks, lips, forehead, neck and the exposed skin surfaces were affected in seven of 24 workers at risk. Dalbergiones were found to be the allergenic components of the wood. Cross-sensitivity to Dalbergia was observed but D. nigra was a weaker sensitiser. Patch-testing with petroleum extracts of the wood and with 3,4-dimethoxydalbergione can produce active sensitisation. This chemical may be used in a concentration 0.1% in petrolatum unless further observations in a larger number of individuals indicate that the concentration should be further reduced (Maibach 1970). Dermatitis from the wood has been reported from Brazil (Miranda Bastos and Matos Filho 1962) and Germany (Hausen 1970). The species is sometimes mixed with shipments of Dalbergia nigra which is becoming commercially scarce (Phillips 1966, Farmer 1972). This species is listed as a cause of dermatitis by Sandermann & Barghoorn (1956) probably from Freise (1932) who listed the species with the common name orelha d'onca. 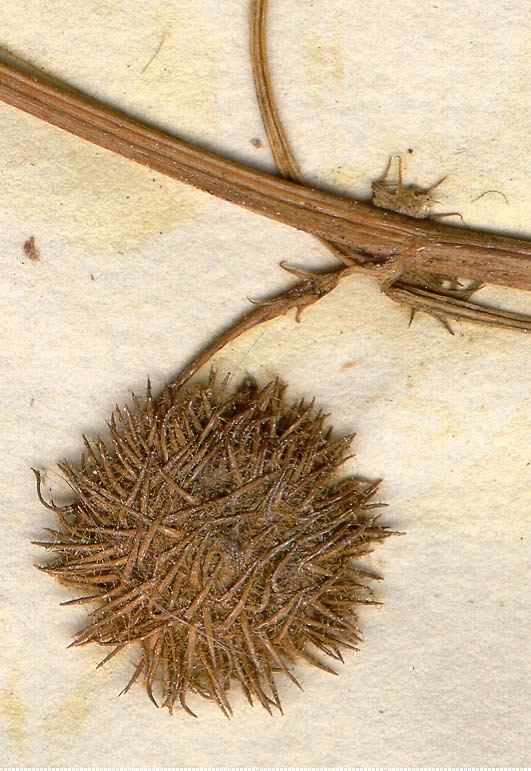 According to Woods and Calnan (1976) the species may actually have been Dalbergia cearensis. About 85 species are native to temperate Eurasia, the Mediterranean region and South Africa (Mabberley 2008). Many of the plants have hooked fruits which attach themselves to animals (Howes 1974). Some are grown as fodder crops and for green manure; others are cultivated as ornamentals. This species bears spiny seed pods, which are said to resemble the crown of thorns; the red spots on the leaves are said to represent drops of blood which fell from Christ when he was crucified. Medicago minima L. ex Bartal. Gardner & Bennetts (1956) note that a type of photosensitisation known as trefoil dermatitis has been associated with the grazing of this species by cattle, sheep or horses. The spiny pods are capable of producing mechanical injury. Dodd (1916) succeeded in proving that the so-called aphis disease of sheep, horses, and cattle in Australia is due to photosensitisation caused by ingestion of this trefoil. The disease, which mainly occurs in the spring, is characterised by swelling of unpigmented and unprotected parts of the skin, with reddening and exudation, scab formation, itching accompanied by biting, scratching or rubbing the parts, and the resultant formation of raw surfaces. Dodd (1916) fed the plants to guinea pigs, those exposed to direct sunlight developing symptoms of photosensitisation corresponding to those seen in aphis disease in horses, cattle and sheep from the 6th day after commencement of feeding. Steyn (1934) referring to Medicago denticulata, Watt & Breyer-Brandwijk (1962) referring to Medicago hispida, and Hurst (1942) referring to Medicago denticulata made reference to this condition, as did Gardner & Bennetts (1956). A record of a similar effect in man from contact with the plant is not substantiated (Mathews 1937). This fodder plant has been suspected of causing photosensitivity in animals following its ingestion (Mathews 1937, Hurst 1942, Watt & Breyer-Brandwijk 1962). Gardner & Bennetts (1956) also make reference to this problem, probably from Hurst (1942). The use of lucerne in guinea pig feed may interfere with experiments concerning photosensitivity (Urbach 1972). Contact dermatitis (Anderson 1944) and eczema from ingestion of a tea (Kaufman 1954) have been reported. Lucerne caused rhinitis, asthma and urticaria especially when it was handled in the dry state, during baling the hay or milling it into powder. The pollen is suspected of causing hayfever (Wodehouse 1971). Injection of an infusion of alfalfa seed as a nostrum for arthritis produced oedematous eruptions in two cases (Kaufman 1954).